We caught a bus from Udaipur to Jodhpur and it has defiantly been the best mode of transport so far. We had a big double compartment, which had a glass screen and a curtain across it to give you some privacy. We also had a big window to get some air too. The only problem is people kept opening our glass screen and curtain. I am unsure why, apart from them wanting to check me and Andy weren't up to anything! We saw a red moon, as well, as we had been crossing the desert. It was beautiful. My first hint that I was still unwell was when we were trying to get off the bus. The simple act of trying to get my bag down from our compartment made me feel sick and dizzy, and I thought I would pass out. We got a rickshaw and then had to walk up a hill to get to the hostel. 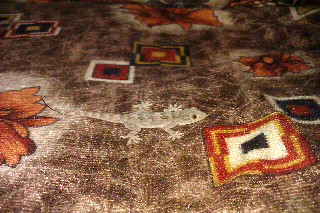 I felt very unwell but felt worse when trying to eat, (apart from when a lizard jumped on Andy), I went to bed. The next day I tried to go out but just walking down stairs made me feel like I would faint. My legs went shakey, like bambi legs. I decided at this point to call the Dr. It cost 500 rupees (£5) for the Dr to come and tell me I had tonsillitis and about 60p for the prescription. I spent 2 days in bed (the second day I made it half way to the fort before almost fainting). 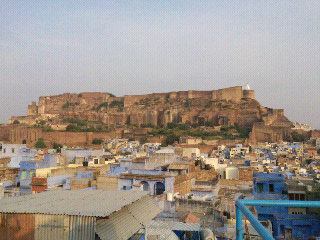 The 3rd day I went to the Mehrangarh fort by myself (Andy went the day before) it was an amazing place. Huge and really beautiful inside, with loads of interesting peices, such as babys cradles, and palanquins (for carrying ladies around) and the audio tour was very interesting. They had some very luxerious rooms, such as the room of mirrors! While I was there people were constantly doing things, and we found out Naomi cambell wad having a party there the next day! Me and Andy then walked along the city wall until a local shouted at us that we couldn't walk along it. We then walked to a memorial of one of the princes which was a beautiful marble cenotaph. Our hostel was amazing. Jodhpur is called the blue city because the old city is all painted blue (in olden times only the high caste, brahmin, were alowed to paint their house blue) and we were right in the middle of the blue houses over looking the fort, and it was spectacular! In the evening Andy did a zip wire around the fort, but since I was still ill, I desided not to Do it!